The South Africans could hardly believe their luck when they found out they wouldn't be facing the player who has twice denied them victory in this series. Graham Onions' omission in favour of Ryan Sidebottom caught plenty by surprise, including the home side who had been left cursing his match-saving defence but also respected his bowling. "He would have been a handful on this wicket, he gets very tight into the stumps and could have been very dangerous," Dale Steyn said. "I'm not taking anything away from Ryan Sidebottom, he's also a very good bowler, but obviously Onions has troubled a lot of our batsmen throughout the series and it's surprising to see he wasn't playing. It was a bit if a relief in a way." Before this match Mickey Arthur joked that the South Africans would have to do extra video analysis work on Onions' batting, after he survived final overs from Makhaya Ntini at Centurion and Morne Morkel at Cape Town, but if they did make extra notes they can now be filed away for another series. The first argument to explain Onions' omission would be that he isn't in the side for his batting. But even though his bowling figures for the series stand at an unflattering eight at 45.75 they don't reflect how he has performed. He was the pick of the pace attack at Centurion and has let no-one down since then. The unplayable ball to remove Jacques Kallis in the first innings at Newlands showed what he was capable of producing. At the toss Andrew Strauss said the team needed some "fresh legs" for the final challenge at altitude, but that does beg the question how much use the six-day gap between Tests had been, and whether three of those days should have been spent at sea-level in Cape Town. Onions has bowled 115 overs in the series, a lighter workload than James Anderson who has sent down 138.5 and Stuart Broad (126). There is clearly an element of horses-for-courses with England expecting swing to play a major part in this game, but the way Morkel made the ball carry showed bounce will also be rewarded. Onions is clearly no Morkel when it comes to height or pace, but has shown the ability to get disconcerting lift from a good length. "He has done a fantastic job, but you can also understand the need for fresh legs - with the amount of overs the three seamers have bowled over the three Test matches," Paul Collingwood said. 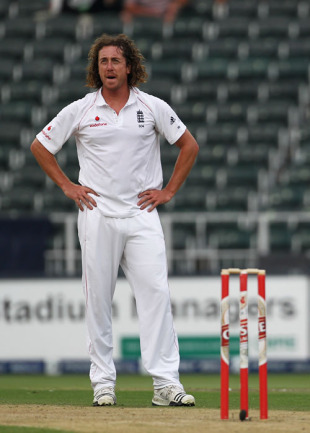 "Ryan Sidebottom is a very accurate bowler, and we hope he'll be perfect for this pitch." There was enough evidence in South Africa's short stint with the bat that Sidebottom could prove a handful. He beat Ashwell Prince with a cracking delivery that seamed and bounced, while he also caught Graeme Smith on the crease with some swing. However, there is the old adage of "if it aint broke, don't fix it", not to mention lingering concerns that Sidebottom is no longer the force he was during his golden period from 2007 to 2008. He has suffered a run of injuries, including a side strain early on this tour, and his last Test was against West Indies, in Barbados, when he clearly wasn't fit. He remained part of the one-day and Twenty20 set-up during the 2009 home season, but lost his limited-overs place after the Champions Trophy. In fact, Sidebottom's last outing in a competitive fixture was the second of the two two-day warm-ups, against a South Africa Invitational XI in East London, in early December where he claimed 5 for 42. Since then it has been a tour of gym work, net bowling and practice sessions. If the selectors have made the right call then all credit to them, but if it backfires serious questions will be asked. England will pray they aren't nine-down with a handful of overs remaining in this match.